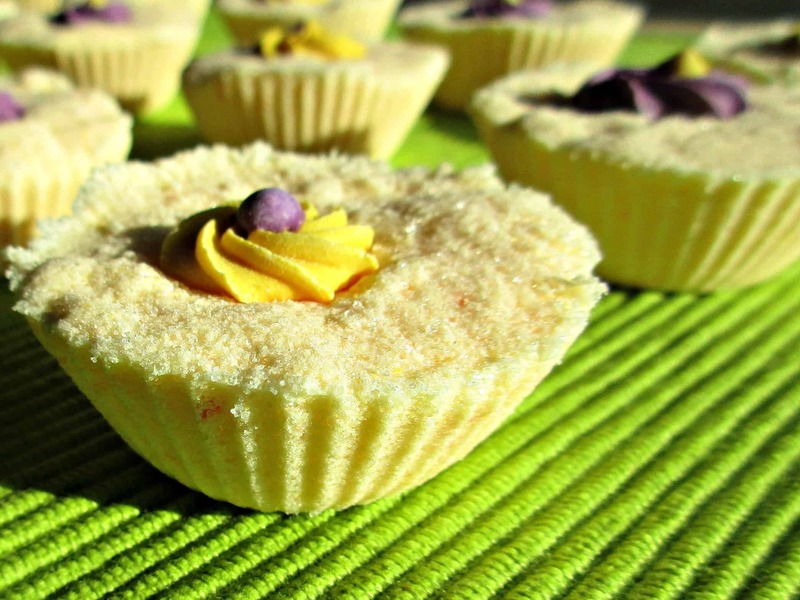 Home-made bath fizzes are really simple and fun to make at home. There are loads of different recipes you can use. Ours is a simple version, based primarily on what ingredients we have available to us, and what suits both mine, and the kid’s skin. We also added 5 ml of Almond Oil (Amazon) and 2.5 mls of Natural Vitamin E (Amazon), fragrance and colour. Citric acid is considered by many to be a great product for treating skin problems such as mild acne, pigmentation, clogged pores, excessive sun tanning, wrinkles, and dark spots. Bicarbonate of Soda is an alkaline substance that is reported to have antibacterial, anti-fungal, antiseptic and anti-inflammatory properties. We used a Tangerine fragrance oil that has a scent we love. Please remember that essential oils should always be diluted with a carrier oil rather than being applied directly to the skin. It should also be noted that not all essential oils are suitable to be used by all people (use particular caution with children and pregnant women). The colour we used is one that is designed for soap making. You can also use food colouring but be aware that large amounts of it will mean giving the bath a clean after use. We sieved our Citric Acid and Bicarbonate of Soda into a Bowl, and gave it a really good mix. It is easiest to do this with gloved hands. 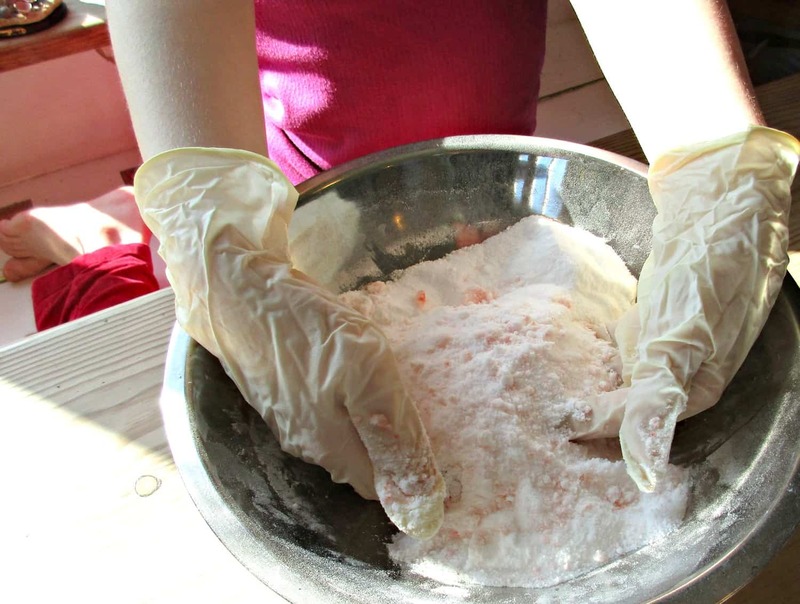 Citric Acid does sting if it gets into broken skin or your eyes, so we strongly recommend using gloves. We mixed our oils together, and added the fragrance and colour to them, before adding it all to our mixture. The oil didn’t cause our mixture to fizz, and we simply rubbed it into our dry mix until it looked well combined. Next you add the water. You only want to add enough water to moisten your mixture, so it’ll stick together. You are looking for the consistency of damp sand (see the photo above). Adding water will make your mixture fizz, and many of the tutorials I have seen suggest using a spray bottle to add a little at a time. 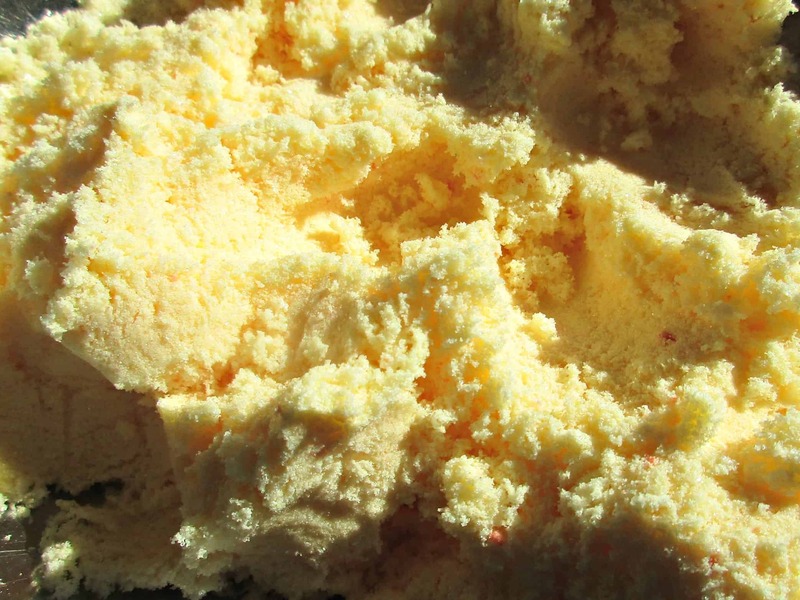 We didn’t have one available, so simply added a teaspoon at a time – with my daughter throwing it in while I mixed. This method worked fine for us, although it meant there was no opportunity to take a photo of this stage. In total we only needed to add about 15mls of water so please add cautiously. Too much water will cause your chemicals to react, and you’ll end up with all the fizzing now, rather than when you add them to the bath! We used little silicon cup cake cases for our moulds. Simply press your mixture in firmly with your fingers – we left ours rough on top so we could embellish them with some little sugar flowers. I think they would look even prettier with some dry petals added. The mixture does harden quickly, so you will need to work fairly fast. Our bath fizzes had hardened enough to remove from their cases in less than an hour . We then left them out to completely dry before packing them into glass jars. Bath fizzes absorb moisture really easily, so we recommend that you store them in an airtight container to maintain their fizz. 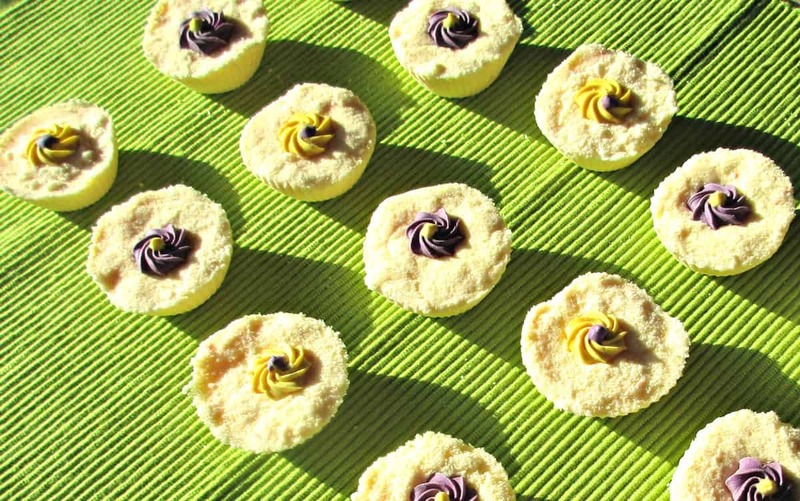 Bath fizzes are great fun to make (and use), and would make a lovely little gift. Please make sure if you do give them away as a gift that you include the ingredients you have used on the label. That will allow your recipient to make an informed choice to whether the ingredients you have used are suitable for them. 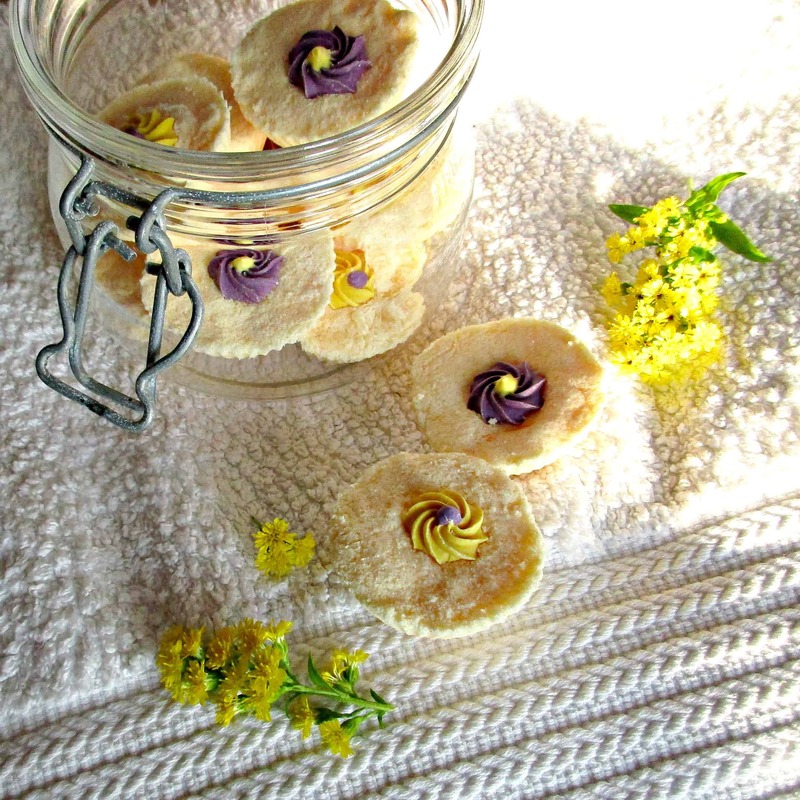 If you have enjoyed this tutorial, please check out our Home-Made Herbal Bath Tea Bags and our Rosemary and Peppermint Foot Scrub. We’d also love it if you shared our post with your friends. I want to buy your bath fizzes. They are perfect gifts. 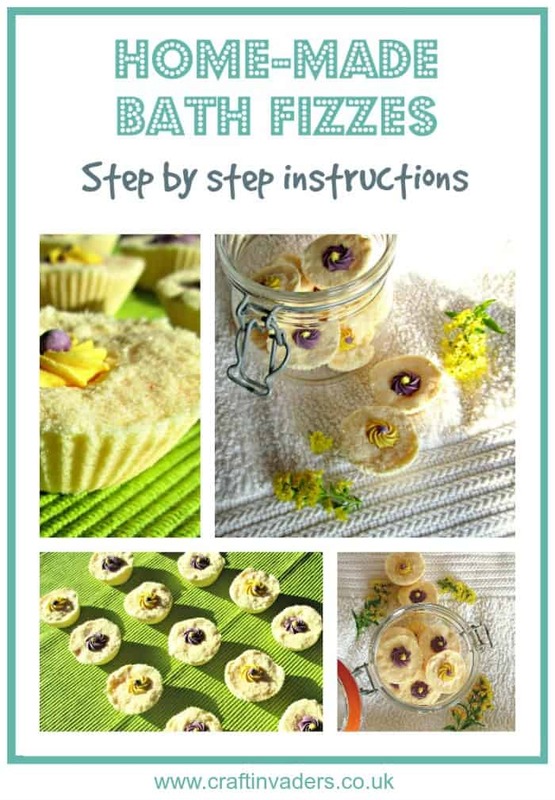 I have been wanting to try making my own bath fizzes, but I hardly ever take a bath unless I’m feeling bad. Guess I will have to make some for gift giving. Thanks for sharing! Can you recommend any suppliers for the ingredients – particularly the citric acid, colours and oils? I had allergy testing last year by GP referral to Dermatology- after 45 years of increasingly bad eczema & strong steroids. I now know the 6 things I am allergic to and can avoid them on my skin ( namely Tea Tree, Limonene, Linalool, PEG-100, methylchloroisothiazolinone & methylisothiazolinone). I just love your blog Sarah, I get completely lost in all your beautiful projects, I’m even neglecting Pinterest and I’ve never done that. I can’t wait to try these. wow, these are beautiful and look so tasty! I love making my own bath fizzies! I’ve made a couple different ones on my blog. Yours are so pretty though, they look like little desserts! Those flowers on top are adorable! I love the idea of using almond oil, I’ll have to remember that for next time! This is great! They are so pretty. 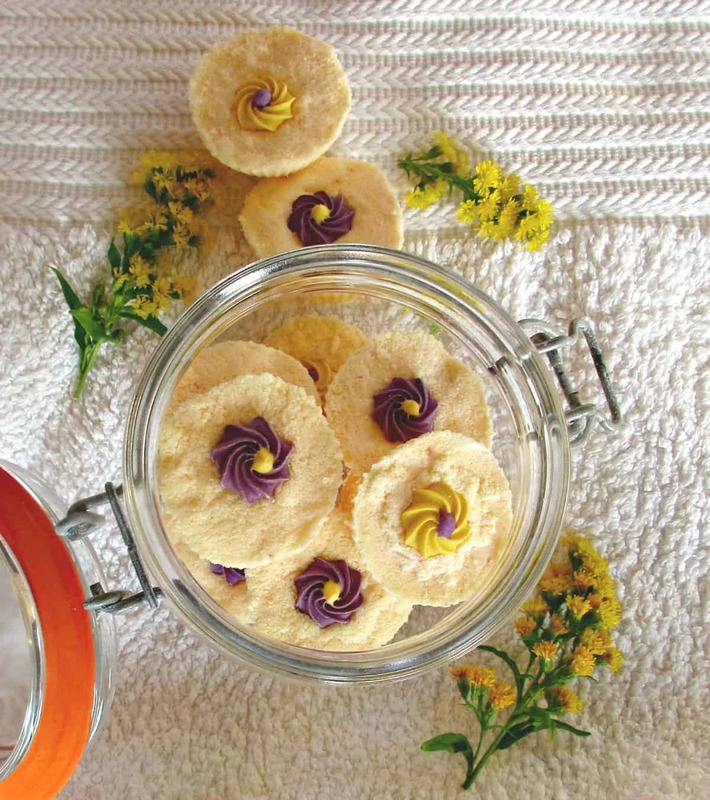 I try to stick to natural soaps since my kids have dry skin and eczema. We’ll have to give this a go…thanks for sharing! Love this! I have never been to lush but keep seeing their products being reviewed everywhere and I must say…I love a bath 🙂 I am going to definitely try this out! Thanks! Thank you – there’s all sorts of essential oils you could use to help you relax, let me know if it works for you! I LOVE baths products! It would be so much fun to make my own, I’ll have to give these a try. And they are so cute! Thank you Jenny, they make a great gift, and are much quicker and easier to make than I expected – let me know if you try them! Hi Sarah, what a lovely gift these would make. I assumed that bath fizzes were more complicated to make, but your ‘recipe’ seems quite simple. I’m not sure though, that my lot wouldn’t try to eat them instead as they do look good enough to eat. They are much easier to make than you would think – dig out that kit! These look lovely and such a good idea for easter presents! I definitely need to have a go at these over the summer! Thanks Becky, my daughter informs me my son did try and eat one (he should know better at 10!) – apparently they definitely dont taste as good as they look lol! I love these! I am a huge fan of a hot bath and love to add a fizzie to spoil myself, so does my daughter! This would be a great project for us to do together, and you make it seem fairly simple with your great tutorial! Are the flowers just sugar pieces used for decorating cakes and cupcakes? I love how the finished product turned out!! !